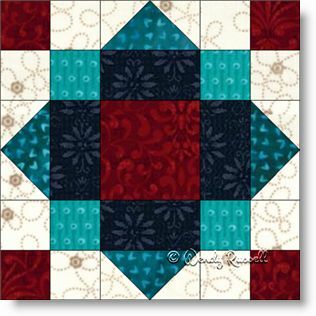 The Nine Patch Square quilt block is a simple block to construct but can be very dramatic depending on the colour choices made. Squares, half square triangles and flying geese units are the chosen patches to construct this easy quilt block. As illustrated in the sample quilt drawings, whether you choose a light or dark fabric for the background can achieve a subtle or vibrant look. It is all in your hands.